Anyone who used a PC in the ’80s or ’90s surely knows the feeling of triumph that came with creating art using Microsoft Paint. Though, of course, calling it “art” when you doodle your brother’s face and scrawl the words “poop 4 brains” on it is somewhat debatable. Prepare then, to feel the sting of loss over the news that Microsoft will likely be killing off Paint after 32 years. 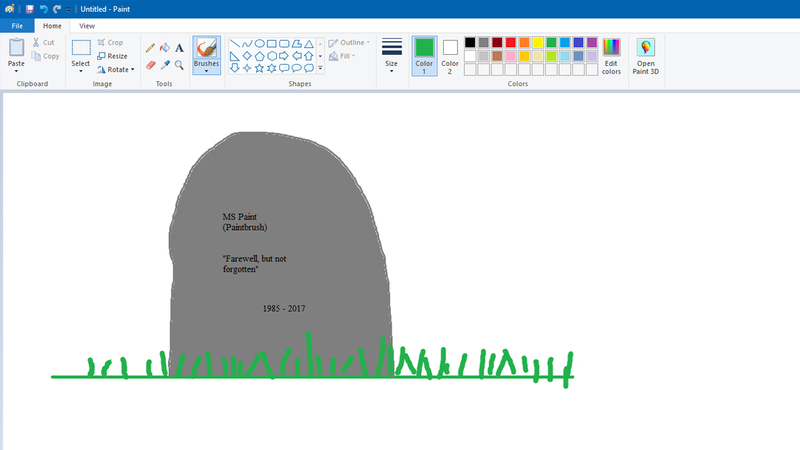 Microsoft Paint was among the applications included in the first version of Windows 1.0 in 1985, but it looks like it’s doomed: Microsoft announced a slew of features and functionalities that will either be dropped in the next Windows 10 Fall Creators Update or could be removed in future releases. Paint is on the list of “deprecated” products, which means it’s not in active development and thus, is likely heading toward that obsolete technology drawer in the sky — especially now that Microsoft has a new program called Paint 3D available in its most recent Creators Update. Don’t start planning the wake yet, however: There’s no timeline or execution date set for deprecated products, and Microsoft notes that this recent list could change at some point in the future. Programs slated for pretty certain death at this point include: Outlook Express, Reader app, and Reading list.